First and foremost... Ramadan Kareem to everyone who observes this holy month of Ramadan. 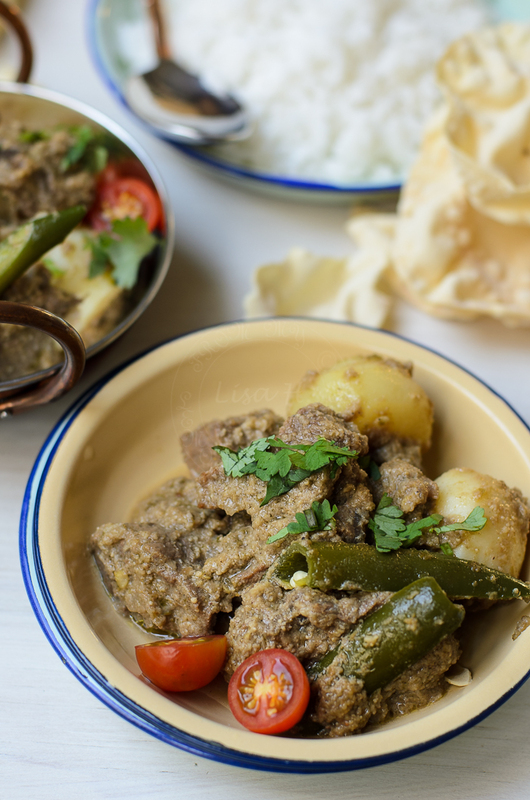 Beef Korma is a mild cousin to beef curry, a distant relatives cousin twice removed ;P to beef vindaloo, and may be an 'out-law' to Beef curry in sweet soy sauce. Beef Korma has no red chillies or chilli powder added hence the colour is much less scarier than the bright red hot looking curries!!! Korma means braised meat in Urdu (according to Mr Google ;p). 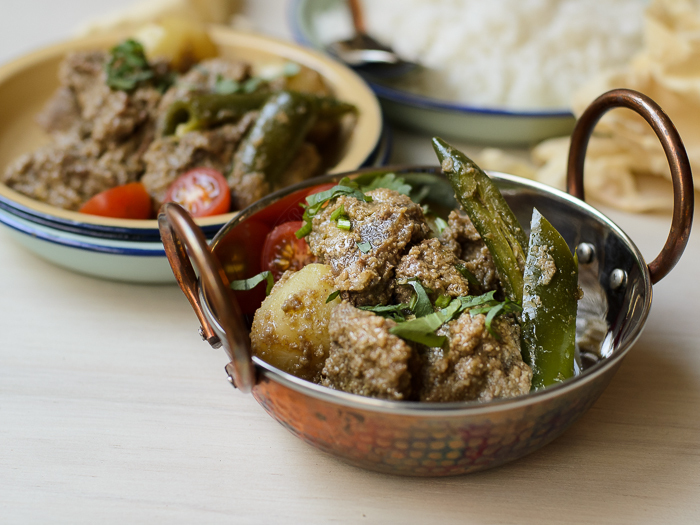 cooked in spices such as coriander, cumin, yoghurt or cream. Korma can be traced back to one of many wonderful Mughlai dishes. Most Malaysians (in the north of Malaysia) has adapted to cooking Korma using coconut milk. 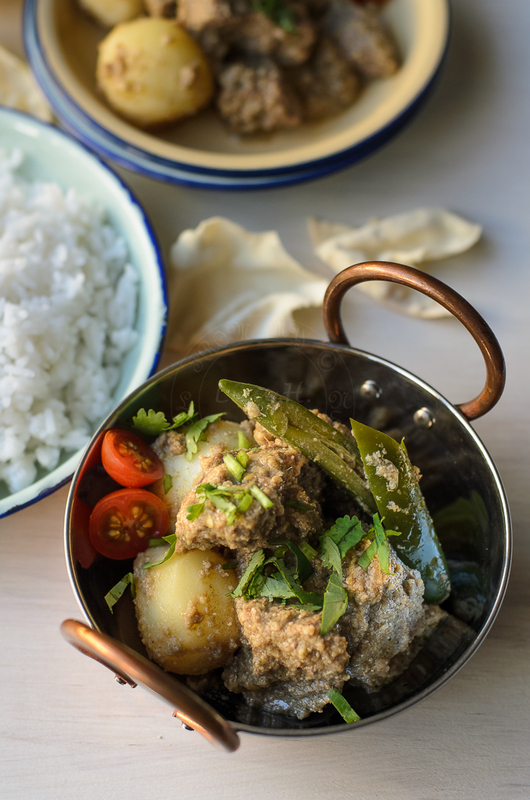 Beef korma is one of the dish that made its way to Malay weddings and served with savoury rice. Beef Korma in this particular post, was cooked using the yoghurt. If you wish... you can substitute yoghurt with coconut milk, just skipped the first step. Add coconut milk after step 13. The suggested amount would be 1 cup coconut milk or 1/2 coconut cream (depending on how much gravy you desire without compromising the overall taste). Overnight prep : add yoghurt and beef in a bowl. Mix well and refrigerate overnight. Take out the meat from refrigerator at least 2 hours before cooking time. Dry roast cumin seeds and coriander seeds (separately) in a fry pan until fragrant. Set aside to cool. Once cooled, grind into powder (grind separately). Add cardamom seeds. Alternate : use pestle and mortar. Blend chopped onion, ground spices (step 2 above), coconut, poppy seeds, chillies, garlic, ginger, cashew nuts, cloves and ground cinnamon with 150 ml water. Add about 4 tablespoon canola oil and fry the sliced onion until brown and caramelised slightly. Cook over 5 minutes or until sauces thicken slightly. Add beef marinated in yoghurt and its juices. Add potatoes and continue to cook for another 20 minutes until meat and potatoes are tender. Serve with hot steaming basmati rice and papadoms. So very flavourful and tasty! I make Korma all the time but vegetarian version! But need to try with lamb using your version.. I have never heard of this dish but I'm excited to try it! I too get intimidated by all those res spices on food and stray away because they typically scream heartburn...but this one looks mild and very comforting! Can't wait to try! Thanks for sharing! There is nothing better than a bowl of warm spicy beef curry. Honestly, nothing. I love korma and this looks absolutely delicious! I love your beef curry! Craving for this dish right now. This sounds just delicious. What a great dish for the cold winter. Well, actually it's warm where I am, but I can pretend. Korma is one of those dishes I love to order. I'll have to give this a shot!